Since our test trucks are no longer available, let’s use this knowledge to configure a system for an electric car just now entering mass production; Nissan’s Leaf Electric Car (Below). 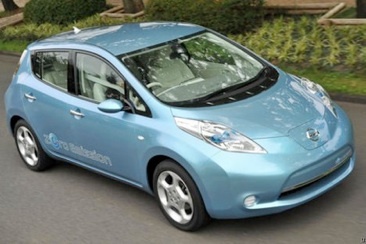 The LEAF (Leading, Environmentally Friendly, Affordable, Family) is a compact 5 door hatchback electric car. It is available for order now and you can make your reservation for one at www.nissanusa.com/leaf-electric-car. It has an operational range of 100 miles and goes about 4 miles on a kilowatt hour (kWh) of electricity used. If you drive 12,300 miles a year like we do you will consume around 3,075 kWh a year. To produce this amount of power with a solar plant in most parts of Arizona (other areas simply use a different factor) you will need a solar photo voltaic system with a DC rating of just under 2,500 kW. As these systems go, this is not very large. (The calculation is similar for a Plug-in hybrid.) At today’s prices and with Arizona utility and tax rebates, that system would cost about $4,500 and $4,800 and will fit with room to spare on the roof of a two garage with a good southern exposure. (the actual pricing for your system will vary depending on the configuration of your house and it’s orientation to unobstructed sunlight). What’s the payback? 20 years of free fuel: Does $4,800 seem like a lot of money? Let’s work the numbers just a bit. If we stay with the example of driving 12,300 miles per year, assume gas price of just $2.00 per gallon and that you are replacing a vehicle that gets 17 miles per gallon; then you get your money back by the beginning of the 5th year of use. You then have over 20 years supply of free fuel left! Don't have the cash? Neither did I. You can finance the solar panels as part of your car purchase or on your home’s line of credit or separately. Because you amortize solar panels for a longer time than most things, payments are low. Thus, your cash flow likely is likely to be positive from the first day you switched it on. That is your monthly loan payment will be less than the cost of the gas it replaces. Better yet, your payment will not go up with the whims of OPEC or the power company. What if you move? The solar panels will not only increase the value of your home at sale, but make it sell faster as well. Or, take the panels with you along with your furniture. Now you understand that a solar powered car is not a solar car like you see in college engineering school races. It does not need panels on the roof in order to use electrons from the sun rather than from coal plants - let alone gas from the Middle East.